Body pillows can be very comfortable. Having a nice cover that you create will make it special. Body pillows are very useful for relieving discomfort caused by the knees pressing together at night. They can be enhanced with embroidery paint designs or hand embroidered. Personalized pillows are always popular with every member of the family. Choose a good cotton fabric that matches the décor of the bedroom. Lace and ruffles can be added after the pillow is completed. Fold the 4-yard piece of fabric so it is exactly double. Place it on the cutting table so it is flat and the folded edge is to your left. It doesn't make any difference whether the fabric is wrong side out or right side up when you're cutting. Measure across the fold and place a straight pin at the 32 inch mark. Measure down the length of the fabric and mark it at 68 inches. Cut through both layers of fabric at the 32 inch mark and the 68 inch mark. You should now have a folded piece of fabric that is 32 inches by 68 inches. The folded end will be the closed end of the pillow cover. Turn the entire piece wrong side out and refold it. Make sure the cut ends match perfectly. Sew a seam down one entire long side. 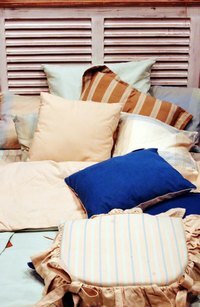 Open the pillow cover and sew a ¼ inch hem on the edges of the top opening. Fold down the part you just hemmed so it is 3 inches from the top. Sew a row of stitches in the ¼ inch hem you just made. This forms the hem for the open top of the pillow cover. Match the edges of the other long side of the pillow cover and sew the side seam down the entire length, including the part you just hemmed. The pillow should now be complete.